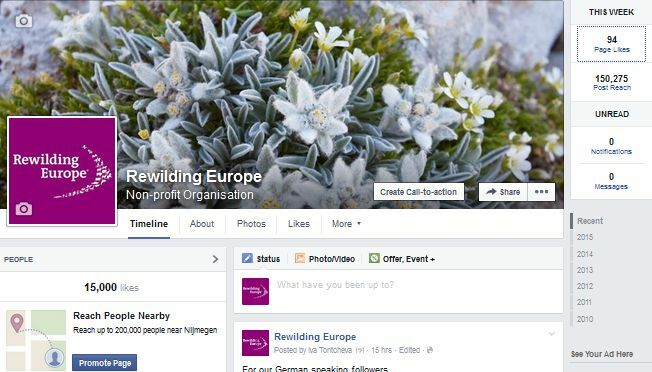 Today, Rewilding Europe’s Facebook page reached 15,000 likes! We are pleased to see such interest in our efforts to make Europe a wilder place. Many thanks to you all for your thousands of Facebook likes! Thanks to all for liking and sharing our posts and photos! Thanks for liking and supporting Rewilding Europe this way! The likes of our Facebook page origin from many countries all across Europe and also from other continents. Top 10 are UK, Romania, Portugal, Netherlands, USA, Italy, Spain, Sweden, Belgium and Germany. The Facebook highlight of 2014 was the European bison transportation to the Tarcu Mountains in the Southern Carpathians rewilding area. Links, photos and video clips from the event were the most liked and shared posts on our Facebook page. In reality, we have reached much more than 15,000 supporters for making Europe a wilder place. With the likes for the Facebook pages of our seven rewilding areas we more than 21,000 likes: Rewilding Romania (news about and from Danube Delta and Southern Carpathians), Rewilding Velebit, Western Iberia, Rewilding Apennines, Rewilding Eastern Carpathians and Rewilding Rhodopes. Please check them out, too! And don’t forget the Rewilding Europe Travel Club Facebook page, a great source of information about fantastic wildlife holidays on special offer or at no local costs. Thanks to all for liking, sharing, commenting and spreading the word about rewilding and the magnificent idea to Make Europe a Wilder Place! Keep following us on Facebook, Twitter and YouTube!